Doing this Advent Calendar makes me realize that I’d be a terrible music journalist. OK, yes, because it’s the day before Christmas Eve and I’m only on Day 10 (thanks so much for pointing that out; you’re a real class act), but also because as I look through past entries, I realize that my selections are so arbitrary. Mind you, they’re all good songs. I eagerly recommend each one. But here’s a peek inside my process. I have a big playlist called “Amazon Advent Calendar 2009 Candidates” that I throw tracks into over the course of a few months. We’ve got a pool of 105 to draw from. he said "we'll meet again we are bloody yet unbowed"
and Oi to the world and everybody wins!" I first heard the Vandals in the Eighties movie “Suburbia” and became a fan. But the first time I heard “Oi To The World” it was this No Doubt version and yes, it’s so much better than the original. It’s a tighter band and a cleaner production. I have actually heard this sort of argument dismissed with the snort “a clear mix isn’t punk.” Yes, shut up. You’re 31 and you work for a real-estate agency. Let’s all agree that hearing the bassline clearly is a good thing and then move on. Plus, you’ve got Gwen Stefani. Once you write that name on the studio callsheet, you’re pretty certain that you’ll have a fantastic track on your hands. I’m guessing that she’ll live long enough to record an inevitable album of standards from the Great American Songbook. Unlike most such albums by singers who’ve left their original bands and their original styles behind and are sort of grappling for their next step, it’s an album I look forward to buying. She has an extremely agile voice; she could really tuck into a Cole Porter lyric. Okay. But there are more than a hundred songs in the Advent Calendar pool. Why choose this one? Every year, my BFF sends me a Holiday mixtape. He’s been doing this for so many years that it started off on cassette. And it’s such a strong offering that I still have a small box of these tapes in storage somewhere. I’m not certain that I have any machine that can play them, but I have the tapes. He picks a different theme every year. It’s a closely-guarded secret. The only constant is the awesomeness. One year, it was lounge versions of holiday classics from various bands. That was a tough one to get through. I’ll put my hand on my heart and state that clearly. Sometimes I’ll come across a track that requires me to serenely commit to keeping my hands on the steering wheel and off of the “Next Track” button on the stereo. Because an “iffy” song is always preceded and followed by a guaranteed crowd-pleaser. In the end I feel like I am a better, stronger man for trusting his judgment and listening to the whole thing all the way through. For his judgment is impeccable. “Your judgment is impeccable,” I emailed him on Monday. The padded mailer had arrived on Saturday, to yelps of squealy glee. I put it on my desk, unopened; I wanted to save it for an hourlong drive I knew I had coming up. I didn’t even want to see the theme or the tracklist until shortly before my departure. But I did tell him how much I was looking forward to hearing it. Monday. Time for the aforementioned drive. The last thing I did before stepping into the shower was open the envelope and rip the disc onto my iPhone. It was 22 tracks of Christmas songs recorded by “American Idol” finalists. I immediately replayed the past 12 months in my head. Had I done anything to piss him off this badly? Does he burn two stacks of CDs for his “Naughty” and “Nice” list? Was this the disc of coal? I determined that this was just one of those times when one must have faith in the Creator. I offered profuse apologies to iTunes for what I was about to ask it to do, and then I clicked the button to start ripping. As always, it was an awesome CD. Not for the usual reasons — 20 awesome tracks — but still, awesome. I’m slightly fascinated by “American Idol” finalists. A few of them are truly good enough to have made it on their own, and (bless you, sir) these performers are all well-represented on the disc. A few are just plain terrible and got to the Final 12 of their season because…I don’t know. Maybe the producers thought that the woman’s full back-tattoo of Mel Blanc would be a good TV or something. To me, the most interesting performers are the ones whose professional careers couldn’t be more clear. If they hadn’t gotten on “Idol,” they would have found steady work in the music business. Weddings, cruise ships, corporate events…I say it without irony. They have marketable skills. What they don’t have is any sense of artistry. What came to mind during my drive through track after track was “supermarket-brand chocolate ice cream.” It’s pleasant. It works. But it doesn’t require you to really process what you’re experiencing. It makes no emotional impact. Your brain responds “Yes, that was labeled correctly: we did indeed just enjoy a dish of chocolate ice cream” and then it’s completely forgotten. Compare and contrast this with the experience of great chocolate ice cream. Better than the premium brands, better even than the stuff made at the ice cream stand ten miles away that’s only open during the summer. I mean a good, small restaurant that makes small batches right in the kitchen, supervised by the executive chef. You don’t get that experience from an American Idol contestant. Even the good ones sing as though he or she’s not meant to distract the listener from their shopping. She sings well enough. I imagine that a 12-year-old is at the age when she might acquire a real passion and decides, ideally on her own, to stop singing strictly for fun and commits to years of hard work. You can hear the potential in her voice. She needs to learn technique and discipline; she needs formal training from many hands. She needs to learn how to connect to, and unify, a live audience. These things takes time, along with the courage to be awful while you expand your skill set. Thus, hand this poor girl an oversized check for $500,000 amid confetti cannons on national TV is the worst thing that could happen for her career. Instead of starting off at age 20 with a mature, interesting voice and potentially pursuing lifelong artistry, she’ll get a year, maybe two, of singing tired pop hits at Indian casinos. Then three or four years of frustration as she wonders why her career isn’t developing. And then she’ll quit. Because at age 12, she defined singing as a career, and not an art. Also maybe because she’s an 18-year-old with a half a million dollars. “Perfect Pitch Via The Braille System.” I felt like I wanted to thrust the music score in their face and tap the notes with a pencil. “Your note is here, I would say, with increasing anger. A professional can see an F-sharp and sing an F-sharp. These jokers feel as though it’s okay to just start in the general vicinity of the right note and then bend up or down until they’re finally on pitch. Note after note after note. It’s not a style choice; it’s a sign of a singer’s lack of ability. Too many notes! You’re singing things that aren’t there. This is another way of covering for lack of technique. A prime cut of steak needs just a light grilling and a side of vegetables. There’s nothing to hide. The “Sea Biscuit” grade gets days of marinating, injections of garlic cloves, and then a burial at sea in a thick rich sauce. A good voice doesn’t need extra notes. The notes on the page will serve perfectly well. “The Constipation Voice.” This is the technique where the first note of every line is sort of squeezed out slowly. As a listener, you sort of have to hang in there. It’s possible that the singer keeps forgetting the next line. It’s more likely that she simply has no taste. That’s one of the things you learn with formal voice training, I reckon: taste. Do away with the tinsel, treacle, flashing LEDs and spray glitter and just sing the damned song. So what does this have to do with “Oi To The World”? I didn’t bother creating a new playlist for this mix cd. Instead, I listened to it via a Smart Playlist that always syncs the newest X tracks to the iPhone. I played the songs in their original tracklist order (which happened to be the order in which they were added to the library). But for some reason, iTunes snuck “Oi To The World” into the middle. I don’t know why. I suppose it was Lilith’s kind act of charity and support during this, my time of great struggle. I’m always pleased to hear a No Doubt song. But I’ve never been so goddamned grateful for one in my life. I present the tune here as an insignificant token of gratitude. It filled me with the courage I needed to get through the remaining 11 tracks. A sprightly rock arrangement of the final movement of Beethoven’s Ninth Symphony. …Dedicated, as we all know, to his wife, Joy. I’m sorry. I am but an imperfect vessel for the Universe’s perfection. It’s a spritely rock instrumental with much to recommend. There’s nothing cheap about it. Check out the Classical department of Amazon or iTunes and look at how many recordings feature variations on another composer’s theme. Rachmaninoff and Brahms and those guys had no problem with this concept. 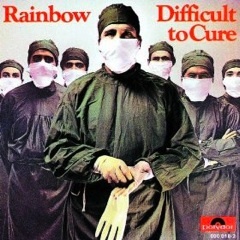 So why should we hate on the fine young men of “Rainbow”? And if you’re a child of the Eighties, this track will inspire your imagination. It’s a rock power-anthem version of one of the most well-known pieces of Classical music. You’ll definitely imagine that you’ve heard it somewhere in the soundtrack of a really bad Eighties light comedy. The posh daughter of a famous orchestra conductor, herself a promising and gifted pianist, is being crushed under the weight of her father’s expectations. She has technical brilliance, but plays without passion. Until she meets Caz, the scruffy teen son of one of the family’s servants. He practices on his Stratocaster in the greenhouse while his mother cleans the floors of the mansion. One day, the girl is lured from her tedious rehearsals by the sounds of his awesome way-high-up-on-the-neck fretwork. A friendship, then a romance, develops. She finally learns passion…in music, in life, and in love. But will this bluejeaned muse with the long hair ever win her father’s approval? The movie builds to her long-anticipated debut, backed by her father’s orchestra, at Really Big Famous Concert Hall. She haltingly begins playing the first measures of the Rach 2, and then stops, slamming the keys. “This isn’t the Rock I was born to play!” she shouts at the conductor. The murmurs of the stuffy, tuxedoed audience and the stern outburts of her father are silenced by a burst of power-chords as Caz knee-slides across the stage. The girl kicks the stool from behind her and joins in, hammering the keys joyfully. The orchestra quickly follows suit as the conductor finally guides and shapes the performance, accepting Caz’ talent and the strength of their love, etc. The school goes on to win the All-City School Orchestra Beethoven Competition thanks to Drek’s inspired arrangement of Beethoven’s Ode To Joy. The orchestra saves the school and they even bested out the snooty, abusive, well-funded orchestra from Pale White Yachting Kids Prep, who had won the top prize every year previously. They’re in a sports bar next to the concert hall. As they continue to argue, the composer is suddenly distracted by the football game going on in one of the huge HDTVs on the wall. Smash-cut to! Barefoot field-goal kicker Bob “Trash” Talken, the “bad boy” of the Baltimore Ravens. He’s just been suspended from the game for his latest aggressive outburst. Furious about his coach’s order to kick the ball offside instead of ‘going for it’ — his personal credo — he starts kicking teammates, referees, anything within range. Inevitably, a fan of the opposing team who’s been beating a big bass drum in the stands throughout the game attracts his wrath. The fan holds up the drum defensively and Trash’s foot connects…producing a profound, pure, resonant tone that booms through the digital broadcast and into the sports bar, causing the composer’s eyes to widen and a smile to spread across his face. The conductor figures out what the composer is thinking. “We can’t,” she gasps. “We must,” the composer replies. One of the symphony’s trustees is a federal judge. He uses his influence to arrange for all criminal charges against Trash to be dismissed, if he agrees to perform community service in the form of joining the Baltimore Symphony. He used to be the NFL’s problem; now he’s the cunningly-attractive but highly-uptight young female conductor’s. She treats his lack of discipline and experience with utter contempt, until she sees Something Decent in him. Trash, for his part, has always secretly feared his own uncontrollable temper and begrudgingly admits that he wants to be a better person. After she melts his rough exterior, he starts to feel something he’s never felt before in his years in football: pride and self-respect. Yeah, the Eighties kind of sucked as a movie decade. I think that’s why it’s the decade in which home video finally caught on. There was really nothing else to watch. No clever setup today, friends. This is undoubtedly the most beautiful piece of music you will have heard in a long time, and the most beautiful piece of music you’re going to hear for a good while afterward. If either statement is untrue, I’ll be ungodly jealous. Actually, first I’ll be derisively skeptical. Then you’ll send me links, and then I’ll either tell you that you’re a lying liar who lies, or I’ll fall over myself in gratitude. Because even after hearing “Mélodies” in nonstop rotation for 31 days, I can’t imagine anything topping it. It’s one singer, accompanied by one instrument. In such situations, excellence is assured if that one singer is the utterly celestial Diana Damrau. The phrase “I would marry this woman” is banded about so lightly these days, by both the commentators who are fumbling for a dramatic way of communicating “I like her work, sure” and by barking-mad people of whom nothing more should be said. So I feel the need to stress that when I say this, I do so harmlessly and with the utmost level of respect and admiration. I am merely imagining a scenario in which I’m somewhere in the cheap seats at the Met, waiting for the curtain to go up on a sold-out production of “The Barber Of Seville,” when the director of the opera company nervously steps out and clears his throat. A few hundred hands go up. One hand remains. An usher fetches me from the fifth balcony and I’m rushed to Diana Damrau’s dressing room, where she’s in full costume and makeup as Rosina and looking at me with hopeful eyes. I would say YES so quickly that the director wouldn’t even bother offering to move me up to the third-balcony, as he’d originally planned. That’s all I mean when I say “I would marry this woman.” You see? That’s not creepy at all, is it? And who knows where that could lead? Maybe she’s been having a problem syncing her iPhone. I fix it during the intermission. She likes the cut of my jib. She offers to buy me lunch as a thank-you. A relationship develops. We wind up touring the world together, ostensibly to throw the INS off the scent. And by the end of the tour, I have learned how people say “Wow! She married…that?” in eleven languages and dialects. Buuut seriously. Are there many performers left on your “I buy the physical CD, unheard, as soon as I learn it exists” list? Diana Damrau is a fixture of mine. Every “superstar” soprano is technically-proficient but few (I wrote “none” but wimped out at the last second) seem to have Damrau’s talent for infusing her performances with such color, character, and passion. Mrs. Ihna…er, Ms. Damrau has a brand-new CD: “Coloraturas.” It won’t be available in the US until January 12. I could pay double and buy it from Amazon.co.uk. Boy, am I tempted. I keep repeating to myself “My strength is as the strength of ten for my soul is pure” and other such nonsense. Fortunately, while poking around for hard information on the US release date, I unearthed this track. It’ll tide me over quite nicely until January. 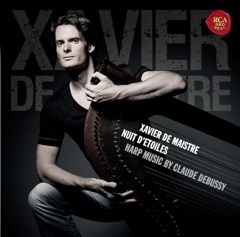 I know nothing about harpist Xavier de Maistre, apart from the fact that he’s another example of the sad trend of popular classical music where it’s not enough to be a virtuoso…you also have to achieve a minimal level of hawt-ness for the CD cover. I do know that he’s sensible enough to bring in Diana Damrau to sing on one of his tracks. That’s a hell of a positive. If that’s the only thing I knew about any one of the five candidates running for a seat on my local school board, I’d mark my ballot with serene confidence. The harp is a fine instrument as an accompaniment to Ms. Damrau. I’ve heard her sing with the full force of vocal fury available to her and I’m pretty sure that she could hold her own against a bagpipe. A harp is a better choice, though. It’s delicate and respectful by its nature, and it leaves lots of “air” in the recording for her performance to move around in. The cumulative effect here is tranquility without a hint of tranquilization, joy without treacle, and above all beauty, beauty, beauty. And I’m also very pleased that I happen to be offering a harp tune right after recommending one by Groucho Marx. Wouldn’t you? If I had kids, there are some basic skills that I’d need to teach them. Whistling, for instance. I can’t fathom how a human being can make it to adulthood without learning how to whiste. The kid will be grateful that I taught him or her to juggle, too. So long as you have three objects, you’ll never be broke or bored if you know how to juggle. And I’d teach my kid all of the words to “Lydia, The Tattooed Lady.” The song comes in handy when you need to amuse yourself and (a) you can’t find three objects, or (b) you are in a tricky spot where juggling might cause you to lose your balance and fall from a great height, or (c) you are in one of those situations where juggling is even more socially frowned-upon than usual. Seriously. Learn the words to “Lydia.” Brush up on your Groucho impression, too. The only way to screw up this song is to take it seriously (and here I’m casting a judgmental eye on several notable cabaret performers with their own peculiar, overly-polished versions in the Amazon MP3 Store). Or Washington crossing the Delaware! It’s also a great little ditty to have standing by if you’re ever pressed upon to speak extemporaneously on any subject. I would approach the microphone, take a sip of water, and begin to speak. I’m confident that nobody in that 400-seat auditorium would feel as though I’d wasted 2 minutes and 42 seconds of their time. Particularly because I would encourage them to join in on the “La-la-laaaaa, la-la-laaaaa”s. And join in they most certainly would. I’m linking to an unusual version. 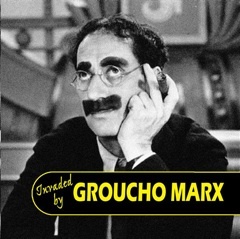 Not to worry: it’s not 17 minutes of Groucho Marx singing. It’s an entire episode of Bing Crosby’s Philco-sponsored radio show, recorded not too long after the war (hence the Hitler line). “Lydia” appears about five minutes in. Groucho is accompanied by Bing himself, who’s too smart to take any of the main lyrics. Instead, you’ve got one of the most gifted vocalists of the 20th century providing the “La-La-Laaaa”‘s. It’s also the highest-quality recording available on either Amazon or iTunes. Other versions of “Lydia” on iTunes and Amazon even appear to be a clip from this exact show, but they’re several generations of duplication removed from the original. Pfeh. Tattooed women and buckshot-riddled senior citizens. That’s a lot of entertainment for just 99 cents, wouldn’t you agree? “Monkey Man” was the Amy Winehouse song that I’d originally intended to use on Day 3. It was used during the end-credits of “Run Fatboy Run” and sometime during the third or fortieth time the movie ran on HBO, I grabbed it from Amazon. Only much later did I realize that I already owned the original version, recorded by The Specials in 1979. It was off of one of my favorite albums, even. Why didn’t I immediately recognize it? Blame the vagaries of how we once consumed music. My first copy was probably a cassette. That’s going back (good God) a quarter century. Once I bought it on CD, my favorite tracks would have gone onto a mix tape; when MP3 set the world on its axis, I only had about a 800K hard drive or somesuch nonsense so I probably just ripped the same three or four tracks that had made it to the mixtape. Everything else dropped off the face of the planet. The needle swung back to its proper position once the cost of storage plummeted. After I had spent an epic month re-ripping my entire music collection with each CD copied in its entirety, lots and lots of songs that I’d owned for years but had completely forgotten about suddenly reappeared in my library. For un-gifted musicians, the song is made even more lovely by the fact that it only contains three chords. Just now I have reached for a nearby ukulele (yes, there is a nearby ukulele; this is an office, need I remind you?) 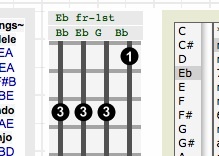 and looked up the tabs for “Monkey Man.” Awesome: I can certainly handle a song with three chords, especially when I’ve already got two of them (F and B-flat) in inventory. Yeah. Clearly that’s a practical joke. It’s like a “Twister” game for your fingers. I can’t hold down the top three strings of that inside fret with my third finger without accidentally touching the bottom string underneath it, and ruining the chord. Wait, what am I worried about? Every time I’m supposed to strum the E-flat, I can just shout “Oi!” and hope nobody notices. 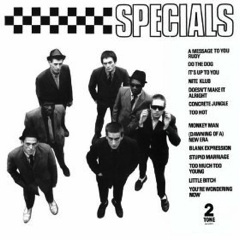 I mentioned that the 1979 version by The Specials was the original. Yes, that’s true…as far as I’m concerned. The first version was written by Toots Hibbert and recorded by reggae band Toots And The Maytals in 1969. The Specials got it the way the British historically get anything: they annexed it, just like their forefathers took custody of the Elgin Marbles for the relics’ protection and preservation, and got much of 19th-century China addicted to opium to make sure that the decadent citizenry would start every morning feeling as though they had a sense of purpose and motivation. They’re a charitable people by nature; it’s time more people understood that. The Specials didn’t have a navy but they showed some of that Dunkirk spirit and they did what they could. They siezed “Monkey Man,” installed a military governor, and then declared it to be an joyous, uptempo number. It’s a rare case where British imperialism actually worked out for the best. To my ear, the Maytals version just sort of spools out onto the floor and lays there. It’s the crushed velvet version of the song, compared with the Specials’ “crushed beercan” recording. I’m not certain that I approve of the “Genre” tag for this particular track. “Miscellaneous”? Did anybody even really try? This is a 1929 Leslie Sarony Jazz-age novelty tune. It’s best performed by a radio orchestra, preferably by men in white tie and slicked-back hair. No fewer than 28% and no more than 42% of the performers should have thin, precious little mustaches. Does that help you, Amazon? I lift up my finger and I say "Tweet-Tweet, Shush-Shush, Now-Now, Come-Come!" I have also seriously suggested that this is the official anthem of the Twitter Fail Whale. I can’t help but whistle the first lines of “Tweet, Tweet” while I refresh the page and wait for Twitter to collect itself. Yes, “Tweet, Tweet” is part of my soundtrack. It’s also part of the soundtrack of “Jeeves And Wooster,” which is how I first came to hear it. This was a fairly awesome BBC TV ITV series adapting the famous series of P.G. Wodehouse short stories. It starred Hugh Laurie before he became an American, and Stephen Fry before he got his first million Twitter followers. Why, it was so long ago I bet he was still on Friendster when the series first aired. I shall leave you with one last unbearably semantic note: the singer of this tune is a goddamned hypocrite. He starts off by saying explicitly that he never makes a fuss when things go wrong. Oh, come now!When things go wrong, he rattles off a Tourettes-style string of nonsense words. His own testimony! Sorry to have to bring it up. I’m one of those brave vanguards who isn’t afraid to speak truth to power. Stephen Sondheim, Arthur Laurents, Leonard Bernstein, Jerome Robbins. Back in 1955, was it considered a really, really big deal that these four men were working together on a musical? I remember how excited I was as a kid when I heard that the next season’s cast of “Saturday Night Live” would include Christopher Guest, Martin Short, Harry Shearer, and Billy Crystal (adored by me for National Lampoon records, SCTV, Spinal Tap, and standup, respectively). 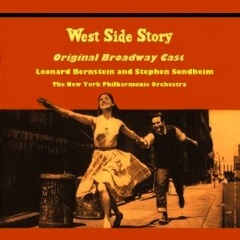 Was there a similar sense that “West Side Story” couldn’t fail to be something special? Or that it couldn’t fail, period? When Hal Prince signed on as producer, did that up the ante even further? I imagine the level of tension that everybody else in the show must have felt. If the show failed, nobody in the theater community would be thinking “Oh, well, what do you expect from that hack, Leonard Bernstein?” No, they’d be looking elsewhere for the Weak Link in the production. Even the guy in charge of cutting makeup sponges into little triangles for Chita Rivera probably felt the need to elevate his game. Not all of these guys were at the tops of their careers at the time, o’course. Sondheim’s beard probably smelled of Top Ramen. Fifty years on, however, it seems like an incredible lineup. If Bill & Ted’s Excellent Adventure had required the boys to assemble the greatest men from the entire history of musical theater, this would have been a very credible list of luminaries. It’s tough to listen to “America” and stay put. If you can resist the urge to clap along to the habanera bits (the CLAP-clap-clap CLAP-clap-clap CLAP! CLAP! CLAP!s), and to play air conga and air cowbell where appropriate, you’re…actually, I think that’s how they test for some sort of neurological or hearing disorder. The doctor takes you straight from the examination room into an MRI machine. You can be forgiven for keeping quiet during the girly yips. As for the Whitey McWhiteperson-style attempts at Boricua vernacular and speech patterns…yes, I suppose “oh dear” sums it up. I know little more about that culture than this can of Diet Dr. Pepper at my elbow but even I have to wonder if “San Chhhhooo-wan” was the result of careful, sensitive research. But that’s nitpicking. 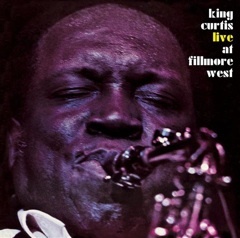 What a wonderful document this recording is. Live theater is a frustrating medium. The window for seeing the definitive production of “West Side Story” closed more than a decade before I was even born. For each individual show there might be some films from individual numbers featuring the original cast, but usually they’ve been cut down for the time constraints of a TV appearance and the space limitations of a TV studio. A show might get lucky and become a movie musical, but its original perfection never survives the translation. The movie version of “America” is about racism in the mainland US, instead of poor living conditions in Puerto Rico. It just bothers me that this phenomenal work is simply gone and can never be retrieved. Nobody needs to describe how phenomenal “The Godfather” was. Just pop it into a Blu-Ray player and you’ll see it exactly the way it was when it was first presented. A little smaller, fine, but with way better projection and sound. A live musical lasts only as long as the echo in the theater where it’s performed. At least we have this: a studio reproduction of the music, as it was originally composed and arranged, and as it was originally performed by the people who originated the roles. It’s considerably better than nothing. Also better than nothing: the few shekels that tumble into my Amazon account whenever you click on one of these links and then buy whatever it is you were going to buy anyway. My nieces and nephews are hoping for X-Boxes for Christmas this year instead of paper-bag hand puppets. It’s all up to you at this point. I had a minor breakthrough with David Bowie recently. It was so obvious that I couldn’t believe that it had taken me so long to figure it out. We penciled in an appointment to hug it all out when he sweeps through New England during his Monochrome Eyebrow tour in 2011. Yes, I’m well aware that one of his tour managers will call to cancel about a week before. 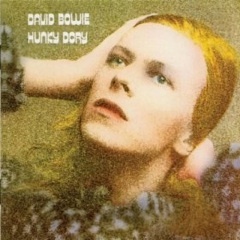 David Bowie is what John Lennon could have and should have been during the Seventies. When the Beatles broke up, Lennon declared that he felt burned-out and he intended to use all of the sick days that he’d accrued over the previous decade of hard rocking. Fair enough, but eventually, Personal Days became a formal Leave of Absence, and then after a bunch of registered letters went unanswered the Universe was forced to (regretfully) fill the vacant position. A New Lennon would have to be whiteboarded, prototyped and shipped, ASAP. And so I say that when John Lennon felt a need to lay down his baton at the end of the Sixties, it was David Bowie who picked it up again. “Life On Mars?” is the beginning and the end of my argument. It might be Bowie’s masterpiece. The music begins slowly, as Bowie’s voice seems to pace thoughtfully around the room, nudged along by Rick Wakeman’s piano. Bits of the melody start to wander in and make their presence known. Only when various muscles and tendons have been fully warmed-up does the arrangement take off; like a kite, it suddenly leaps into the air and once it reaches altitude, it parries around as though being 200 feet off the ground is the simplest thing in the world. Not a word of that would seem out of place on either side of “Sgt. Pepper.” It’s lyrics as sound-play, meant to provoke imagination rather than understanding. Lennon had an uncanny ability to aim higher than Lewis Carroll but not smack his head against the extreme of psychedelic nonsense. Bowie’s achieved the same vibe here. It’s possible that becoming The Great John Lennon is a bit like becoming The Dread Pirate Roberts. You’re meant to prosper in the role until it’s time to pass it along to somebody else. I don’t know to whom David Bowie passed the Lennon Baton but it was definitely sometime between “Under Pressure” and “Cat People.” While killing time in a bus terminal he came across a glossy brochure entitled “Make Big Money In International Pop Superstardom” and then he couldn’t drop that stick fast enough. It seems to have worked out all right. He’s married to a supermodel and has the ongoing respect and support of the public. I’d like to think that Lennon would have made out as well. I’m sure he would have agreed that the presence of the album “Never Let Me Down” in Bowie’s discography was a very small price to pay. A last-minute substitution, sensation-seekers. 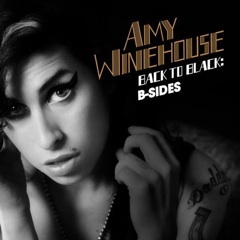 My original pick for today was a different Amy Winehouse tune, which I’d bought months ago as part of a soundtrack. When I hit Amazon to grab the link, I found that the song was originally part of this compilation. I started sampling tracks from “Back To Black” and this song stopped me dead. “Love Is A Losing Game” represents the highest degree of difficulty for a vocalist. It’s a tricky melody and very subtle one, but for all of that it’s still a blank canvas that requires the performer to truly invest and connect to the lyrics. If she maintains an emotional distance, the song makes little sense. If she coasts through even a single measure, the performance will come across as naive or glib. If she does it just right, however, she’ll inspire the listener to tap the “repeat” button on the iPod and pour another glass of something. The listener will then lean back, close their eyes, and think about things that have gone horribly wrong recently. That’s excellent value for just 99 cents. Performers like Amy Winehouse fascinate me. She’s up there with Sinatra, Janis Joplin, or Billie Holiday. She goes far beyond the capabilities of “someone who sings extremely well” and crafts a unique performance for each song she records. The similarity extends, unfortunately, to the way that her enormous talent is becoming eclipsed by the fictional character that represents her in the public’s perception. When you think “Sinatra,” you think of the celebrity tough guy who at times acted mostly as a host organism for hairpieces and tuxedoes. Joplin is the classic rock and roll live-hard hippie drug burnout. Billie Holiday? Tragic lost lamb who clung to the wrong life preservers. Amy Winehouse seems to epitomize the Internet-era celebrity career curve. Initial fascination turns to fame and fortune which leads to an endless stream of humiliating photos and videos on TMZ and Gawker. And then one day, I’ll hit Twitter and find that “#AmyWinehouseRIP” has become a trending topic. Everyone’s to blame for this modern phenomenon. TMZ is to blame for sensationalizing sad-and-bad public behavior. We’re to blame for reading it. And I suppose Amy Winehouse must be blamed for engaging in the sort of pre-show rituals that ultimately force her to stumble off the stage in mid-song to vomit in the wings. We all need to do better. The first thing you should think of when someone says “Sinatra” is “One For My Baby.” If it’s anything else, then it can only mean that our system has flaws. What an idiot. Amy Winehouse is no Jessica Simpson or Britney Spears. Their musical careers were propelled solely by celebrity. Inevitably, the public moved on and these two were left hanging in midair. The best they could hope for was that their managers could slide the “Dancing With The Stars” airbag underneath them before they hit the ground. At some point, The public will get sick of seeing Amy Winehouse’s semi-lucid face staring foggily back at them on websites and tabloids. They’ll move on. And all Amy Winehouse will have left will be her phenomenal talent as a vocalist. If she can keep herself vertical and above ground, she’ll be fine. A track like “Love Is A Losing Game” represents the only credentials she needs. It’s a bare recording. It sounds as though she and a guitarist sat on opposite sides of a USB microphone plugged into a MacBook, tapped “R” in GarageBand, and hoped for the best. It’s an honest and revealing performance. It’s almost conversational, complete with the hesitations and other imperfections you’d hear from a woman who’s simply speaking thoughts as they occur to her, instead of a performer who’s reading off of a heavily-rehearsed script and sipping a Red Bull before launching into Take 21. So what did those other singers ever get, by losing self-destructive habits and staying out of the tabloids for most of their lives? It’s obvious: they got to live to see 50. Which is bad news for the longevity of their work as artists. But I bet that this Christmas, Annie Lennox’s kids are happy to hear Mom sing “Winter Wonderland” live in the living room instead of via the last CD she recorded before her mescaline-fueled hydrofoil accident in Macau. A giggly six-year-old girl running towards you shouting “Grandma!” beats pop-culture immortality any day. Oh, what a tricky minefield it is, to select the First Song In The Playlist. I ask you: how many high school Winter Formals were ruined before they even began, thanks to a clumsy DJ who kicked things off with Spandau Ballet’s “True”…before the teens have gotten liquored-up enough for a little slow-groping? Hmm. Pardon me while I look go Google something. Okay, that tune was released over a quarter-century ago. That’s irrelevant. Does it matter how long ago was “Call To Post” composed? Indeed it doesn’t. As soon as that trumpet tune peals across the paddocks, the horses and the riders know that it’s time to mount up and “True” has a similar timeless stimulus-response effect upon its audience. Countless generations of babies are destined to be born to teenage parents, thanks this masterpiece of the New Romantic movement. Yes, it’s time once again for my annual Amazon Advent Calendar, during which I recommend a different Amazon downloadable track every day through Christmas. You people get a little music, and I get the satisfaction of having helped my fellow man and woman. As well as a little kickback from your Amazon purchases after you click the link…whether you actually buy the track or not. Suh-WEET. I’ve been doing this Advent Calendar for a bunch of years but 2008 was the first time I thought to embed kickback links. I thought that I’d maybe make thirty or forty bucks from them. You know, enough to partially offset the cost of all of the tracks I buy while making my selections. It wasn’t until weeks later when I got my statement from Amazon that I realized that, um, I probably should have chosen the “send me a check” option instead of Amazon store credits. So to everyone who read parts of this series last year and might have thought “That was a neat 30-second sample, but it’s really my bag. Hey, so long as I’m on Amazon, I might as well do a little holiday shopping” I can only say: thanks for the free HDTV. Onward. And back to the topic of “the first track in a playlist.” You want to get the crowd up and on its feet immediately. Your goal is to lure them away from the steam-table buffet and onto the dance floor. This sounds like a job for some classic R&B. Indeed it is. And it is Awesome. I got to attend a Letterman taping last week and I can emphatically assert that the great reward of waiting a year or two for tickets is getting to hear the band play. I mean, you don’t miss a thing when you watch Letterman kick it around with Robin Williams on TV. But when you watch at home, you only get to hear about five seconds of the band’s music before the show cuts away to a cartoon fungal parasite peeling up people’s toenails and carving through the exposed flesh. The band gets the audience pumped up with a couple of numbers before the show starts, and yes indeed, they play full numbers through the entire commercial break. Always masterfully-played, always high in intensity. When they launched into the familiar, pumpy intro to this song and Bruce Kapler started belting out the words (which I’ve never caught before) I immediately got out a pen and started jotting down any unique lyrics so I could search for the track later. “Them Changes” was purchased almost as soon as I got back to my MacBook and an Internet connection. 1) It needs to be a live performance. I need a big band of musicians feeding off each other’s energy and the audience’s. 2) It has to be played uptempo. I was surprised by the tempo of the original edition. It’s just a smidge slower than the arrangement that you hear on Letterman, but those few beats per minute make all the difference. 3) Give me a full brass section. I can’t fault Carlos Santana or Eric Clapton for dancing with the girls they brought. And they’re lovely guitar players. But this is a steam-powered tune and for steam, you need heavy pipes and lots of ’em. 4) Paul Shaffer plays one hell of a Hammond B3 organ. Thus, no version of this song is in anyway acceptable without one hell of a B3 solo. Suffice to say that if you’re cleaning the kitchen and you’ve got your iPhone docked to an iPod Hi-Fi and this track comes up on Shuffle Play…put the glasses and dishes down. The urge to groove is irresistable. And incompatible with the handling of delicate stemware. I speak from experience.